This is a review of the Domain-Driver book and its content only. Keep in mind, that this book can be bought also with code, exercises and workshops. Those weren’t the subject of this review. This is a review of the beta version of the book. Arkency didn’t mention that on their site, but this has already been fixed. I highly recommend checking their website for updates and/or fixes, as not all the points from this review might still be valid. The author was kind enough to comment this review, so please go to the comments section for his perspective. It’s been a while since my last technical book review. 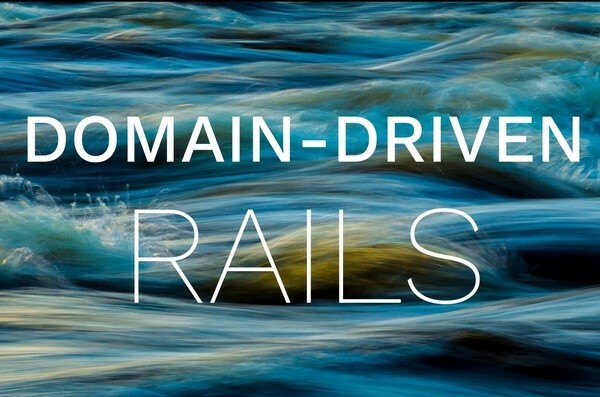 I’ve decided to have a go at Domain-Driven Rails as this subject is one of the things that I’ve been particularly interested in for quite a while now. For those who don’t know me, I’m the creator of Karafka framework, a tool that can and is used for simplifying Apache Kafka based Ruby applications development. It is used by multiple teams for implementing the Domain-Driven approach (mainly, for the Domain events / Event sourcing parts of DDD) within their Ruby and Rails applications. I’ve been using the DDD approach for both: new and existing systems for over 3 years and I can definitely say, that if you want to build complex systems, which can be maintained and developed, this is the way to go. But is Domain-Driven Rails the best book to read before tossing yourself into deep end? Unfortunately, I’m not quite sure. The aim of this review is to help you decide whether or not this book is a good choice for you and is it worth spending $49 or more. Who is the book target reader? you’ve never used Sidekiq or any other background processing tools. Of course it doesn’t mean that it won’t be useful for you at all. It’s more about giving the problems and challenges described in this title a deeper, personalized context without which it will be just a next theoretical (from the usage perspective) position in your library. It’s also not a glossary type of book, which you can open, find a solution and close it again. DDD is a huge subject and cherry-picking of some parts as remedies may not be the best idea. you’ve just started a new job in a company where they use DDD and you want to get a grasp of it but don’t have too much time. In such cases, go for it, but before you do, please read the rest of the review. Advanced programmer reviewing book for mids? Does it even make sense? You might say, that I’m not the best guy to review this book. You might say, that I’ve been using the approach and solutions presented in it for a long time, so my expectations may not exactly be met by this book. And I think just the opposite, because I remember myself reading Implementing Domain-Driven Design and trying to adapt knowledge found there into the systems built with Ruby and Rails. I remember times, when there were no decent libraries nor articles for Ruby programmers on that matter. Heck, that was one of the reasons Karafka was born! Below I present some of the things that I liked/disliked in particular. If you are interested in a TL;DR version, please go to the summary section. Undoubtedly, there are some good aspects of this book. Here are a few that I appreciated the most. I’m a big evangelist of DDD and its components. I really appreciate the time and the effort Robert & the Arkency team invested to make DDD more accessible and easier for Ruby and Rails developers. If you strive for more information on a given matter, at the end of each chapter you will find tons of references and links for further exploration. Sagas are one of the things I find hard to explain to people*. We are accustomed too much to the HTTP way of thinking. Sagas are meant to be asynchronous and they need to be designed that way. Luckily the guys behind this publication didn’t forget about it. They embrace it and present a few ways of dealing with this kind of situations. If the message queue that you use gives at-least-once delivery guarantees your sagas should be idempotent and handle duplicated events. Too bad though, that they didn’t mention the exactly-once Kafka’s feature. The book is rich with examples. Many of them are from finance-related systems that Arkency develops and maintains, which adds an extra value to it. Most of them are clear and stripped out of useless parts that aren’t relevant to the discussed subject. The good part is behind us. Now it’s time for things that in my opinion made this book much worse that it could be. Rails or Ruby, Ruby or Rails? One topic that was relevant here is how to grow as a Rails developer. Shouldn’t this approach be applied to writing books as well? If so, then maybe the book should be called DD for Ruby. I’m not saying, that this book is tightly bound to the Rails framework, but it would be good not to become too reliant on “The Framework Tooling”. If you get knowledge from a framework perspective*, it will always be distorted. 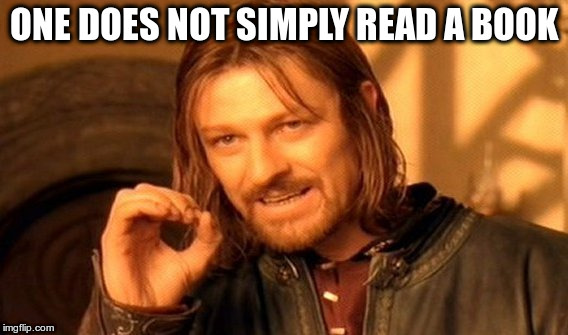 More or less, but it will be and you need to remember this while reading the book. we will discuss in a moment. The lack of glossary at the end is also a bummer. Especially since (as mentioned), there are times when the explanation for a term is not during its first occurrence. I’ve counted a number of pages where there would be less than 50% of text and/or some oversize images. There are 23 pages like that. It means, that more than 12% of the book is useless. Note: this point might no longer be valid. Please visit the Updates section of this review. It took me 1 day to read it. For me, +/- 120 pages of content is not enough to call it a book. 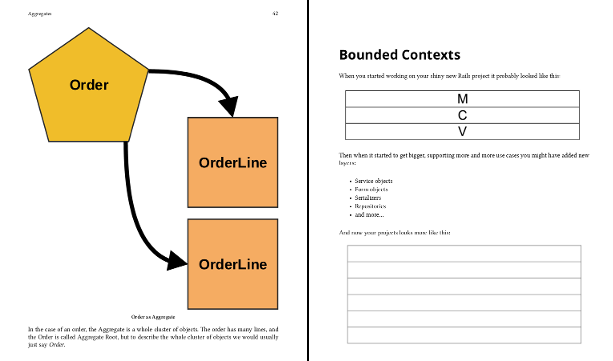 If you decide to buy this book and use concepts and code snippets presented there, keep in mind, that you might become Arkency-dependent. They present their libraries, their approach and their solutions. There would not be anything bad about that, if they explored other solutions and tools available. (…) I strongly recommend at the beginning of your journey into the world of asynchronicity, eventual consistency and async handlers: a message bus with a queue in the same SQL database that you for your app. It really simplifies error handling on many levels. You might not be able to deserialize YAML events in other technologies that easily. You cut yourself from a set of flexible tools that will allow you to easily expand and replace Ruby based components with those written with Go, Elixir or any other technology you find suitable for doing certain jobs. You might become narrow-minded about potential solutions and tools you can add to your stack (because they will have to play along with the Arkency gems). Going for an all-in-one DB solution, tightly integrating all aspects of your software with it, makes it much harder to replace a message bus like that with a more generic one. Note: I wouldn’t mind that at all, if the books description stated, that most of the examples and code snippets are related to their gems and libraries. Long time ago, when Rails weren’t that stable in terms of concepts and internal API, I used to say, that a released book about Ruby on Rails is already an outdated book. This sentence was true especially for printed versions that could not be easily updated. But I’ve never seen a book that would use abandoned and outdated gems. I was quite surprised to notice, that there are almost 2 pages about Virtus, a library that was abandoned by its creator Solnic (great explanation on the reasons can be found here). Everyone that used to use it, knew from 2015, that it’s going to be totally dropped in favor of the dry-rb ecosystem. But hey, probably authors explore those in the book as well. But did they? I am not super familiar with the dry-rb ecosystem but I am pretty sure that dry-types, dry-struct and dry-validations provide a nice experience in building command objects as well. I know, that the Lean approach is getting more and more popular, but should it be applied to books? I don’t think so. Note: This has already been explained in the Updates section and in the comments section of this review. When I buy a programming book, I expect it to be written by people that deal with the subject on a daily basis. What did I get as a bonus in DD Rails? 11 page long description of Robert’s first Eventide encounter. Really? I don’t mind him playing with that set of libraries. I would even appreciate his point of view on them in a blog post, but spending 11 pages out of a book just to describe his first impressions on it? Note: Please read the Updates section as not all of this TL;DR might be up to date. Believe me, I’m not happy to say it, but I must. This book is mediocre at best. Its content could fit into 10-15 blog posts. Then I would say, that it is a really good starting point for people not familiar with DDD. But to sell it as a book? presenting only a single set of libraries and a single perspective on the subject. There’s a huge difference between expectations against blog posts and books and I think, sometimes it’s worth reminding some people about it.  Note 1: If you have an option to use micro services and/or event-sourcing, go for it! Rails solutions based on shared models and a single shared database, can bring you in a longer perspective more harm than good. Note 2: This approach is great when your data is tightly coupled and you can’t easily switch from a single app to a distributed model. However, his approach towards migrations comes from his really specific use-case (two DBs in a single app – one shared and one private). However with some benefits, you get a huge (in my case) drawback – when you copy migrations, their timestamp is being changed. It means that if you share same database across multiple applications that also share the same engine, you will end up with a single migration being executed (assuming you install the migrations) from each of the separate applications. 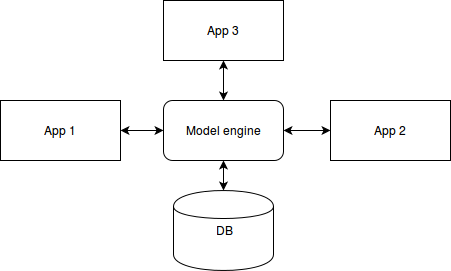 Most of the time sharing models is bad, but there are some cases app data is really tightly coupled together and exposing API with building microservices around it would mean a huge overhead. For such cases model gem with internal migrations might be a great solution. Cover photo by: Unsplash on Creative Commons 0 license.